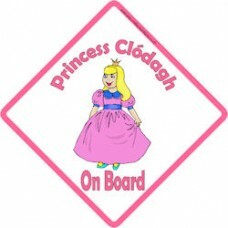 We have a wide range of Princess on board car signs for you to choose from. We have aimed to cover off a wide range of different princess styles, including princess crown, castle and even a pretty princess rainbow. We are continually expanding our princess on board range, so should you have any ideas or suggestions, please get in touch and we can create a brand new princess design just for you. 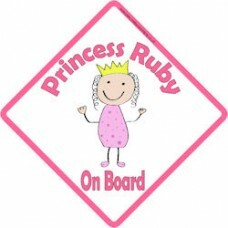 Don’t forget, our princess on board car signs can be personalised in several ways, by choosing the name, text colour, font, border colour and background colour! No other car sign supplier offers you this ease of choice when purchasing your car sign. 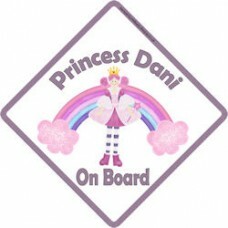 Simply choose from the drop downs to customise your princess on board sign, and click add to cart. Your little princess is on board and you drive her around all day long, to school, to dancing, to horse riding, to parties. 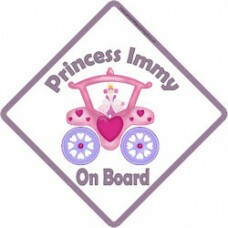 Why not put a smile on your little princess’s face with her very own princess on board car sign. 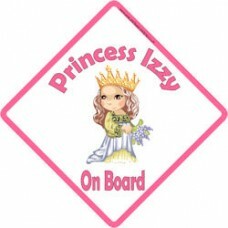 Our princess on board car signs were one of the first designs we created for our catalogue, and since then we’ve expanded our princess range with more and more, also including additions such as the crown, carriage and rainbow. 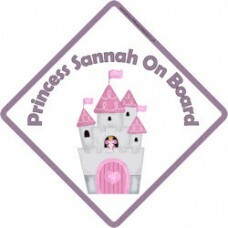 Our princess on board range is currently our best selling range overall, we receive some great feedback from happy parents and children about their car signs. Some of our signs have been used in some very interesting ways, we’ve seen them attached to pushchairs, wheelchair and even on the back of a go-kart. We are always looking for new ideas and suggestions, so if you would like to see something in our princess on board range that we don’t currently offer, please get in touch by email, or via our create your own form. Let us know the details you would like on your princess sign and we will draft up a sign unique to you. A short while back we were contacted by a small facebook group for disabled children who expressed an interest in our signs. They asked us to create a princess on board sign with the inclusion of a wheelchair. They felt current signs for disabled children were still very serious, and just because it was important to make it clear that disabled access may be required to their car, there was no reason why they could not be fun. 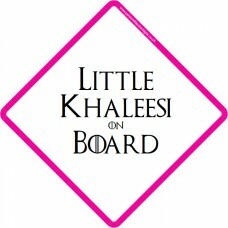 A new wheelchair princess on board sign was created and has been a big hit. We had a lovely email from a lady who told us about the trouble she was having with her daughter and long car journeys, she had tried lots of tactics from colouring books, seat back DVD’s, sing along CD’s etc and had some limited success once they were on the journey, but the main difficulty was getting her in the car in the first place. She decided that the car just did no appeal to her daughter (who had a very creative imagination) so she decided to decorate her car as a princess carriage for her. She recovered her car seat with some pink sparkly fabric, got some accessories for her to wear in the car such as a tiara and a princess wand, and then used one of our princess on board signs with a photo of her daughter dressed up as a princess and put it in her window. Now whenever they need to make a trip anywhere, they no longer go in the car, they go in the princess carriage. A simple idea, and with just a tiny bit of imagination, has made the car journeys a lot easier! We were glad we were able to assist! 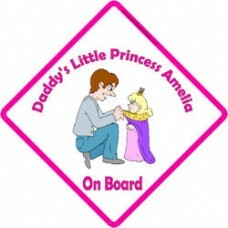 So when your precious baby starts to grow up into your little princess, what better way to show them that they are now becoming a “big girl” with their very own princess on board sign. You can give this to them when they move from a car seat to a booster seat. 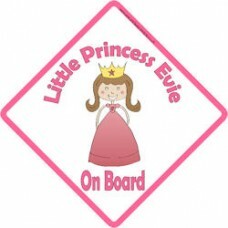 Our princess on board signs are available in small (14 x 14cm) which fit nicely in the back of any car, and in the small side windows of some models, and large (21 x 21cm) which are great for slightly larger windscreens. Our car signs aren’t just restricted to car either, they are great for a variety of places, and because they are all bespoke, the wording can be adjusted to suit your exact requirements. They can be used to stick to the plastic windows of a wendy house, in caravans, on boats, or even just stuck to a window in a bedroom, anywhere with a nice smooth surface where the suction cup can stick to.